Sullivan's Show Road Replenish Electrolyte Paste [ECP] : Highland Livestock Supply, Ltd, Products for all of your show animals! 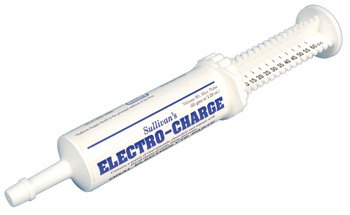 60 cc tube - An easy to use electrolyte in a paste form. Gets your livestock drinking again. Replenishes minerals and organic compounds to the body lost through dehydration due to stress, shipping, scours, etc. One tube contains two doses. For best results, use Electro-Charge paste then follow up with Appetite Express paste to keep the stomach working properly to provide for an aggressive appetite.